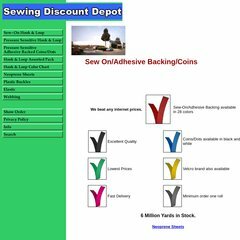 Topics: Sew-on, Pressure Sensitive, Pressure Sensitive Coins, Info, Color Chart, and Neoprene Sheets. The site has about 28 users daily, viewing on average 1.70 pages each. yns2.yahoo.com, ns8.san.yahoo.com, and ns9.san.yahoo.com are some of its 4 Nameservers. It is hosted by Inktomi Corporation (California, Sunnyvale,) using YTS/1 web server. Hookloopoutlet.com's server IP number is 68.142.205.137.